14 Day Free Trial - Try it risk free! Free training already provided inside on how to use, including a 21-day email series. Integrates with all major email and payment services in the market. Easy Drag and Drop interface and no coding required, allowing you to create beautiful looking pages easily. Requires a subscription of at least $97/month to maintain your funnels. What It Is: Clickfunnels is one of the leading softwares to create great looking funnels/landing pages which converts your traffic into sales. You don’t need any technical experiences to make this software work for you. It is also an all-in-one solution and helps you save money in the long run! Pros: You save a lot of time when making a funnel, plus money as well if you port everything into Clickfunnels. There are many features you can create such as automated webinar, membership sites and more included with your membership too. Cons: It’s a huge investment cost every month which may be scary to most people who are looking for the cheapest. I would say Clickfunnels is really worth it for the price point, plus with the 14 day trial there’s essentially no risk involved. My Recommendations: If you’re serious about converting traffic and customers into sales, Clickfunnels does it for you easily without the hassle. You will save hours and hours of time instead of piecing different softwares together just trying to make something work! Check this out if you’re looking for a solution that gives you the bang for your buck. Clickfunnels promote itself as the tool you need to market, sell and deliver your products online. 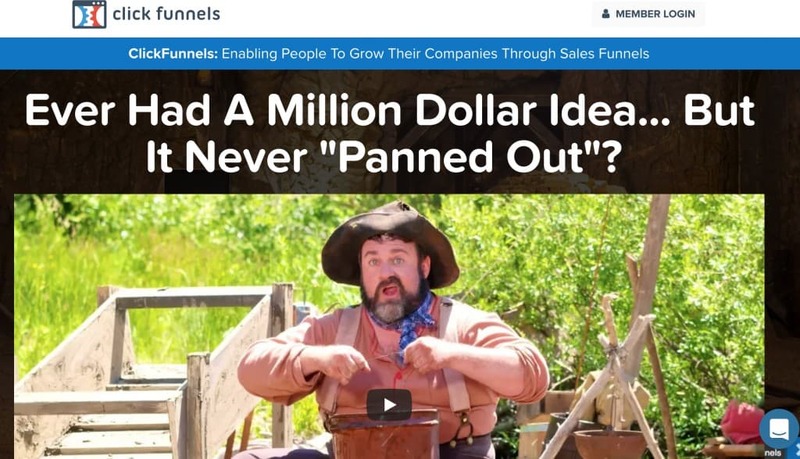 After watching this hilarious video about Clickfunnels, the sales letter below talks about how entrepreneurs are being stuck and shackled from the lack of coding and technical knowledge required to start your own business. Without the ability to create a great funnel, your dreams are essentially dead because you have no way to market your product or services. Right below that, there’s a quick process to show you how you can create your own sales funnel simply in just MINUTES. In less than 10 minutes, it would take you hours with coding just to do the same exact thing. Clickfunnels is not only a landing page software like many others, but also includes funnels that give people a higher chance to convert them into customers. And the best part is that it comes with a 14 day free trial, but requires your credit card to begin. Personally, I have been a Clickfunnels member for about 6 months now as of writing this article, and have used it over a year on my friend’s business. I’ll be covering the 10 reasons why you should sign up for your free account immediately to start unlocking more cash in your business. You immediately get over $10,000 worth of value, plus can essentially shave off tons of costs when you integrate everything to Clickfunnels. These training are meant to help you get your first funnel up live and running and is guaranteed to make at least $1 if you follow the steps implementing everything. These include the Best Seller Book Funnel, Product Launch Funnel, Perfect Webinar Funnel, “Real Stuff” Funnel, Fishbowl Funnel, Network Marketing Bridge Funnel. There’s literally something for everyone! With so many goodies and offers, starting for free is a great way to test it out and see if it works for you and your business. As a frequent user myself, I will be reviewing why Clickfunnels is so powerful in helping your online business make more money compared to all its “alternatives”. Let’s check it out below! If I haven’t already mentioned that you don’t need coding enough yet, YOU DON’T NEED TO KNOW HOW TO CODE WITH CLICKFUNNELS! 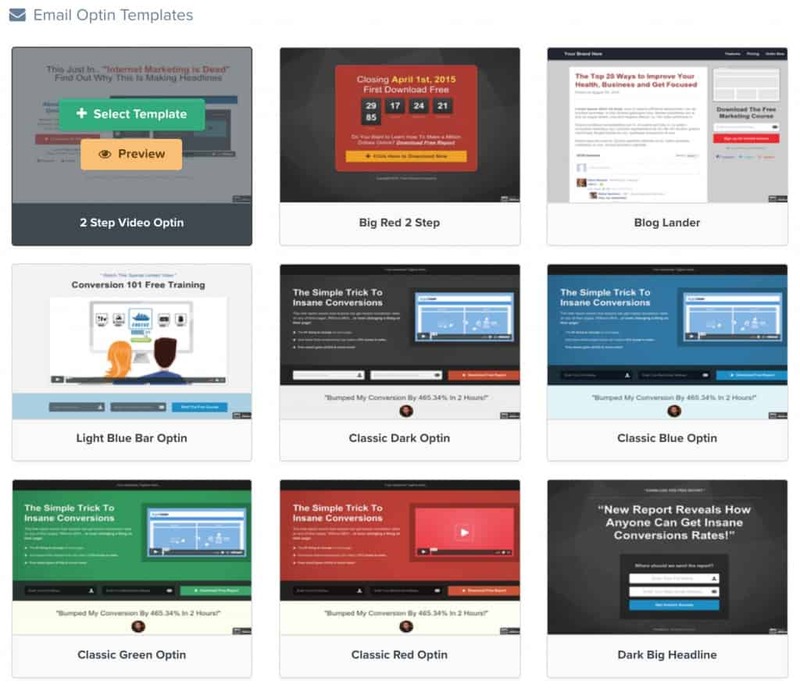 Depending on what you are using Clickfunnels for, they have tons of template ready for you. How about sales funnel templates? Got you covered! How about Thank you pages once someone takes action on your page? With all these great templates, you don’t need to worry about your page being ‘ugly’. The designs are all made to look professionally done, and at the same time give you the highest chance of converting your traffic into customers. Talk about killing 2 birds with 1 stone! 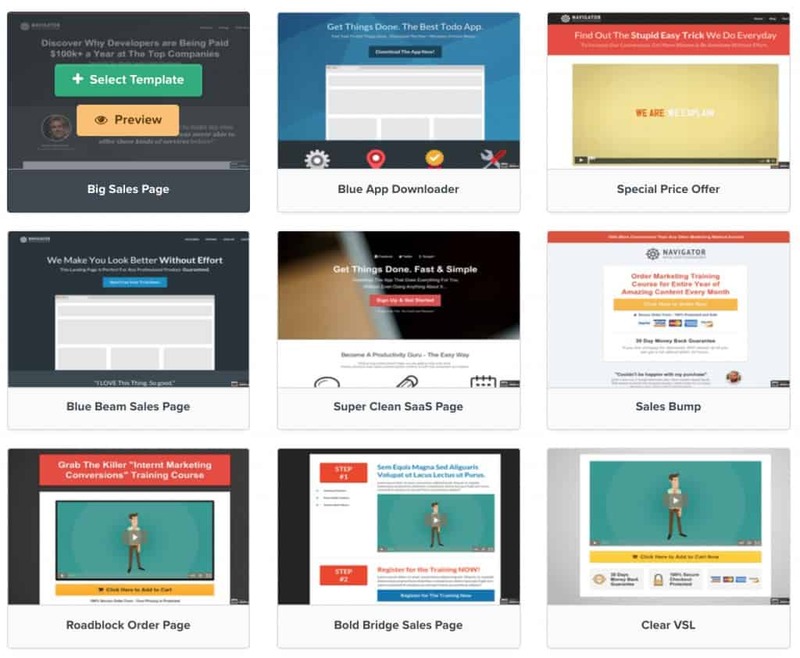 It may seem very overwhelming when you first start using the software, but the video shows how easy it is to build a sequence of pages for your customers to flow through. To start, click on the yellow ‘Add New’ to begin the process of picking a funnel. For this example, I will choose to collect emails. So once clicking the green choose button, all I need to do is name the funnel and then click Build Funnel. At this step, you choose your template for both your Opt in and Thank you page. Pick the design that you prefer the most and suit whatever you are selling. Step 3: Edit Your Design! This is where you get into each page and design the page to your likings, add in the text and change whatever you need to. The above picture is actually a template design, so you don’t need to change much except putting in the headline, text, tagline, video and a few more elements after that. Once you’re done with that, all you need to do is set up your page settings and then integrate it with your favourite email provider such as mailchimp or aweber. Then you’re ready to start collecting leads! You would want to change the name of your funnel, the URL, insert your domain in, and a few other things before you go live. Under each page as well there’s a ‘publishing’ tab to change your funnel path to a proper url. That’s it! You’re done and have your first live funnel ready to help you start collecting leads. Most industry players in each category are in this list and most people uses these services. You won’t need to be afraid of not having anything integrate with Clickfunnels. Clickfunnels does a lot more than just being a landing page software like Instapage or Leadpages. a. Taking the hassle of piecing every page together. One thing Clickfunnels does it give you the ‘base’ to work with. If you’re doing an opt in page, you start with two pages (Opt in + Thank you page). 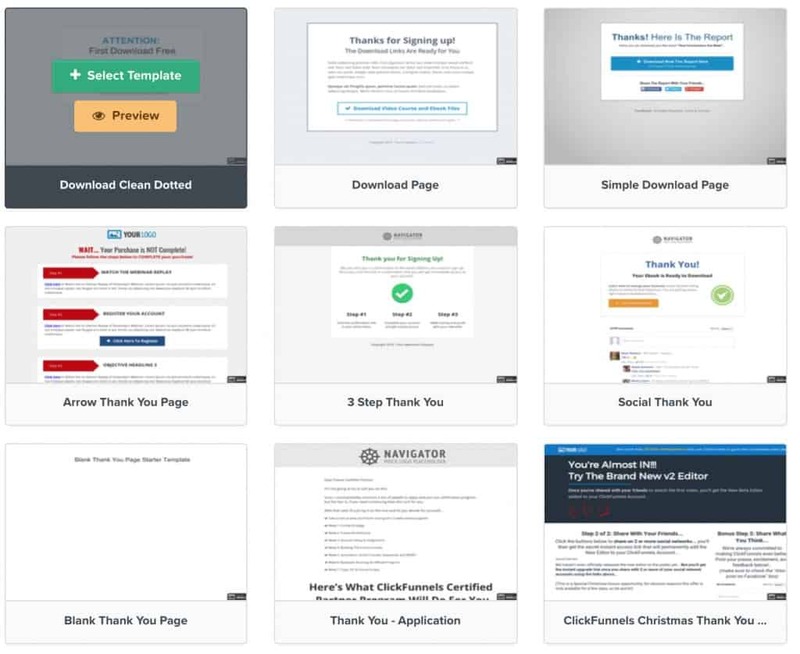 A sales funnel gives you 4 pages (Opt in page + Sales page + Thank you page + Confirmation/Download Page) to work with, with the option of adding upsell or downsell pages in it. You don’t need to ‘think’ what pages to put together because Clickfunnels does the hard part for you as they have spent millions testing what sequence of pages work and what doesn’t. What you get is optimized perfectly to get the highest result from your funnels without needing to find out what’s working. 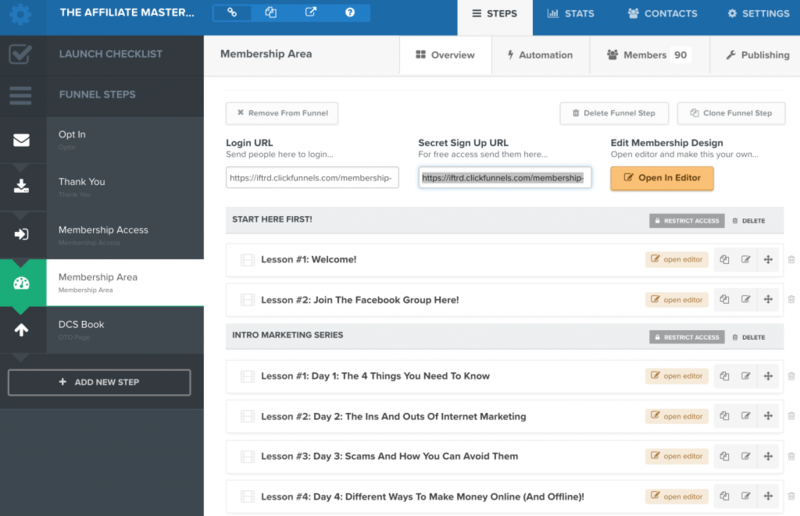 If you have always wanted to build a membership website, Clickfunnels has an in-built membership system that you can utilize as well! Above is a screenshot of my membership site that I giveaway when you opt into my mailing list. This is entirely built on Clickfunnels as well and it funnels from the Opt in page to the thank you page, then to the membership website. If you are planning to use Clickfunnels primarily for membership website only, Clickfunnels may not be the best choice. However, it’s a great way at no extra cost to create a mini membership website. Clickfunnels can also help you to make webinar funnels. Even though they can’t help you host a live webinar, you can easily integrate popular webinar softwares such as WebinarJam to make the process a breeze. The best part is that you can host automated webinars with Clickfunnels. 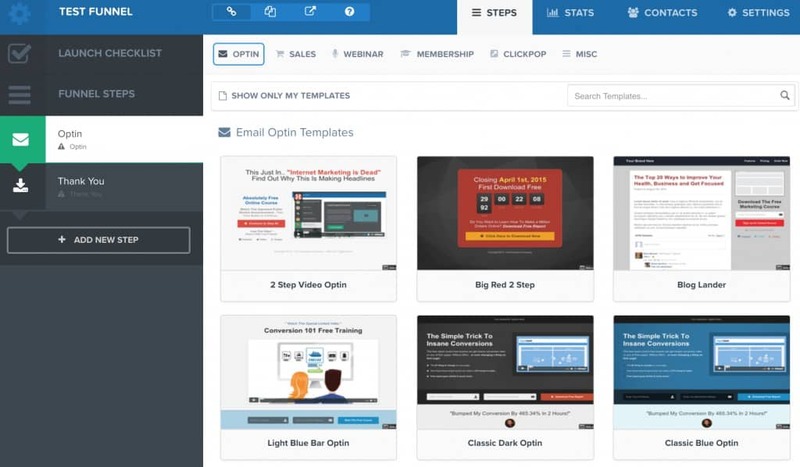 You can get people into your automated webinar funnel and go through the entire process from opt in to watching the webinar to buying something at the end. You can integrate email follow ups right from Clickfunnels without the need of external autoresponders! Once you set everything up, the autoresponder from Clickfunnels will do the rest of the work for you in following up. 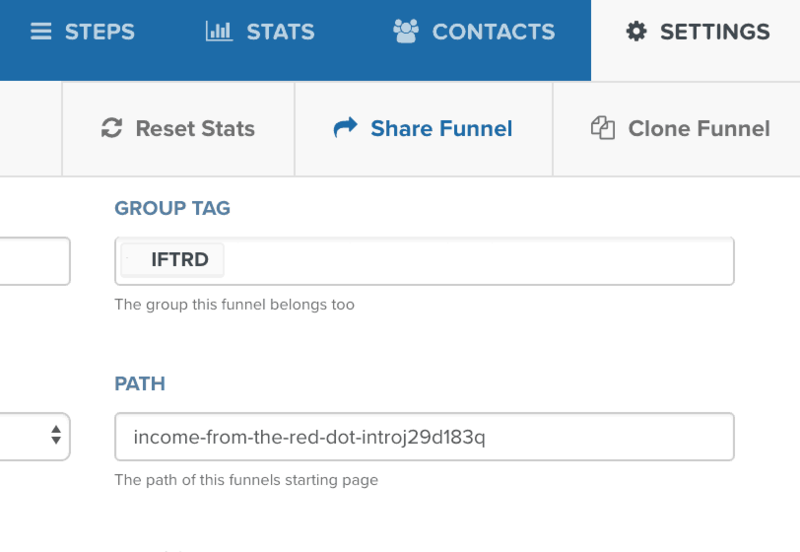 Clickfunnels make it so easy for you to track all your numbers to make sure you’re on track. on how each page in each funnel performs. From this I can easily see that Out of 82 page views, 49 of them are unique, and 8 people opted into my funnel. After that, I made 2 sales out of these opt ins which is valued at $3,994. Just set the traffic to each page by using the slider to direct the amount of traffic to either page. If you want to test which page is better, you can try a 50/50 to see whichever performs better. Even though the split test may not be as advanced as other softwares in the market, the process of setting up a split test to A/B test is fairly simple to get things going. One thing that’s great about about Clickfunnels is a 14 day Risk Free policy where you can use Clickfunnels entirely for free for 14 days. On top of that, Clickfunnels offer a 30 day money back guarantee if you decide it’s not for you. In fact, all their products tend to be backed by this guarantee too. 9. Get Help Quickly From Multiple Channels! In case you get stuck on Clickfunnels, there are multiple ways you can get help. One way is through Clickfunnels itself if you need to ask account-specific or sensitive information. You will be guided through a process of asking a question. After which, the support will get back to you after awhile during office hours. From personal experience, the wait time is typically at most a day or two only before they get back to you. It’s one of the best ways to solve many technical issues with your Clickfunnels account or anything account related. Out of the many times that I’ve sent in a support ticket, the support has always been very helpful and gets my issue resolved quickly. How about if you need help or to bounce ideas? There’s a Clickfunnels Facebook group for that if you need to ask any questions, which is growing extremely at a rapid pace. I’ve seen many people ask questions here which gets ton of response from its members as well too. You may be wondering if Clickfunnels is a ‘new’ company or whether it may be another ‘scam’. I did a detailed research on Russell Brunson and his company Etison LLC who are behind this program. Every of his single listing here belongs to him, including an author profile provided by Google. With all these articles and results from Russell, he’s definitely a somebody online and his company has been around for at least 10+ years and is still going strong with his latest launch of Expert Secrets and his viral video on Clickfunnels main page now. Still Not Convinced To Make The Switch? Clickfunnels offer a lot of benefits along side with your membership as well, here’s 4 more reasons you should! 1. Earn An Extra Source Of Income Promoting Clickfunnels! Besides using Clickfunnels for my business, I personally earn a small side income from promoting Clickfunnels. You can possibly do the same as well by integrating Clickfunnels into your business. Besides that, Clickfunnels doesn’t just have Clickfunnels but many other products which includes books, programs, coaching packages, membership websites that can pay as high as $3,000 per sale and up to $120 monthly recurring income! Once you signed up, you will get the affiliate program free of charge and is tagged to your name. After which, you can promote Clickfunnels and start earning commission! The best part is that once you get 100 active people to sign under your link, Clickfunnels offer to pay $500 off your car rental monthly, and $1000 off if you get 200 active people. There’s a huge load of perks just for referring people to Clickfunnels, including earning commissions from people who buy future products but is tagged under your name. If you want people to sign under you easily, refer to point #2 below. If you’re someone who is in the consulting space or regularly share your landing pages with others, you will definitely love this feature! It’s called share funnel, where you can easily create a copy of your funnel and share it with whoever you wish. In your funnel, all you need to do is click the ‘Share Funnel’ button. 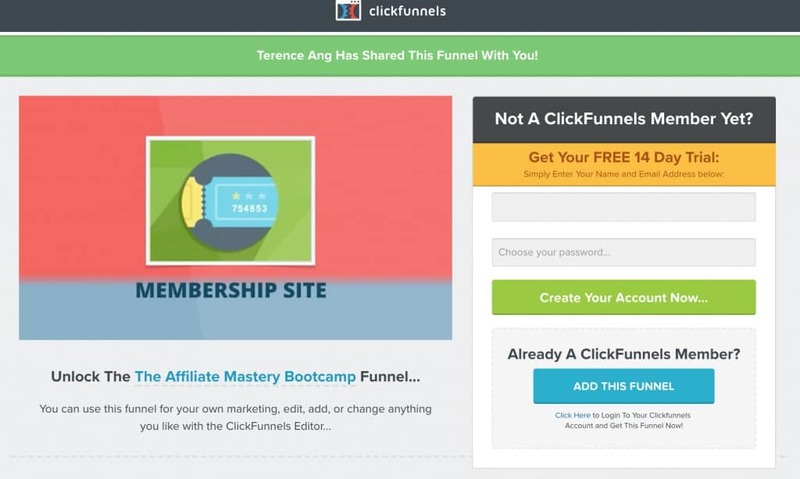 Any existing Clickfunnels member can log in their account and get the funnel immediately, but any new members will have to create an account. The best part? Anyone who registers under this share funnel will be tagged to your affiliate account. This means you get to earn commissions on whoever who choose to stay after the trial. If you’re doing consulting, you can easily share funnels to your clients and they can easily sign up and use the funnel almost immediately. It saves you and them a whole load of time too! 3. Use Funnels More Effectively Quickly! It may be difficult to even use Clickfunnels for the average person as there’s a lot to learn. How about using funnels effectively for your business, and implementing them into your processes? 5. Funnel Builder Secrets: Essentially one of the newest programs that has been created. It is designed to be an all-in-one solution to funnels where everything is provided to get a funnel going – from traffic, to writing the copy, to conversion, and more. 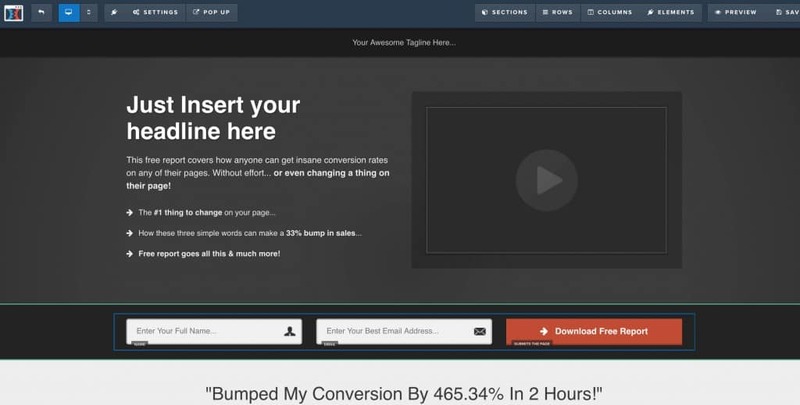 This program also includes Funnel Hacks (#3) and Funnel Scripts (#4) in the bundle. Russell created Clickfunnels knowing that people will need help in fully utilizing the funnels to the fullest potential. These are some of the products you should start with in order to use Clickfunnels to the best possible extent. Actionetics and Backpack are two addons for Clickfunnels, costing $297/month if you opt to use these features. So what are these features for and how it can help you? Actionetics is meant to replace your autoresponder and fully integrate your email marketing into the system. With actionetics, you can see everyone who opted into your list through Clickfunnels in the Contact Profile pages. With Actionetics, you can easily send email broadcasts and the email builder makes the process a lot easier. Backpack is a great e-commerce tool, and a great way to boost your sales with the use of affiliates. It helps you provide an affiliate system to any of your funnels instantly. Also, you can add anything you need for affiliates such as affiliate links, email swipes, copy, banner adds, etc. You can easily support your affiliates to help them convert on your products better. There’s also the ‘sticky cookie’ that Clickfunnels is famous for. It helps affiliates keep track on who registered through them and allow them to earn commission on future products you release too. This helps affiliate earn more, combined with a 2-tier commission system which gives affiliates much more incentive to promote for you. Owners: Russell Brunson, Etison LLC. Get Clickfunnels today if you want to 10x your traffic, conversion and sales! 14 Day Free Trial – Try it risk free! I have been using Clickfunnels for over a year now where I started using it with a friend’s company for his business. 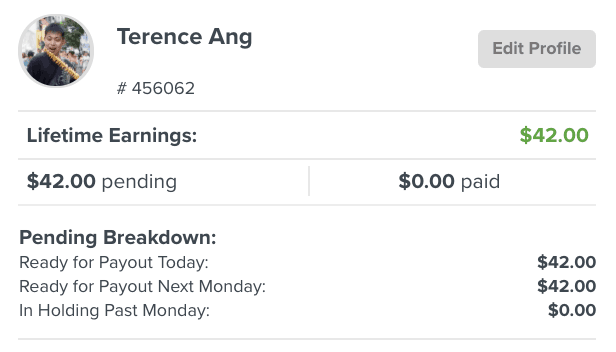 I recently picked up my personal subscription to it for my own websites and side businesses because of the ease of use, and also the ability to promote for them to earn extra commission. For one, I know Clickfunnels is THE BEST program out there to create funnels now, combined with the ongoing upgrades and support from the team that cannot be beaten by the competitors. YES, it can be costly at $97 per month. But for the investment, it has already helped me covered my cost for my personal use already. That’s not including ALL the training that will be included in your purchase which includes 3 free membership websites to learn how you can use funnels for your business. Funnel Hacks is where I started with too, and is definitely a program you need to get if you are thinking of investing with Clickfunnels as the information there is worth over $10,000 or even more. 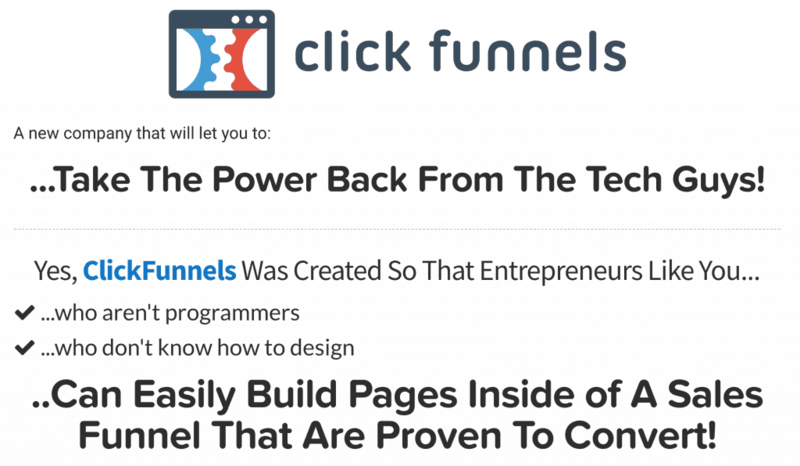 You can read my review of Funnel hacks over here, or click the button below to get your discount for Clickfunnels. However, if you are still new to business or lack the income to get a subscription, I suggest you take a look at the Clickfunnels Affiliate Boot Camp to learn how you can make money promoting Clickfunnels as a program. You can check out my review of the affiliate boot camp and how it can help you make money over here. Overall, Clickfunnels is one of the best programs I used for my online business till date. Most people that look past the price point have benefitied from using funnels in their business to boost their sales and income already. Why not try it out for just 14 days? If it doesn’t suit you, you can easily cancel your account with a push of a button. No need to talk to anyone who will hard sell you to stay. 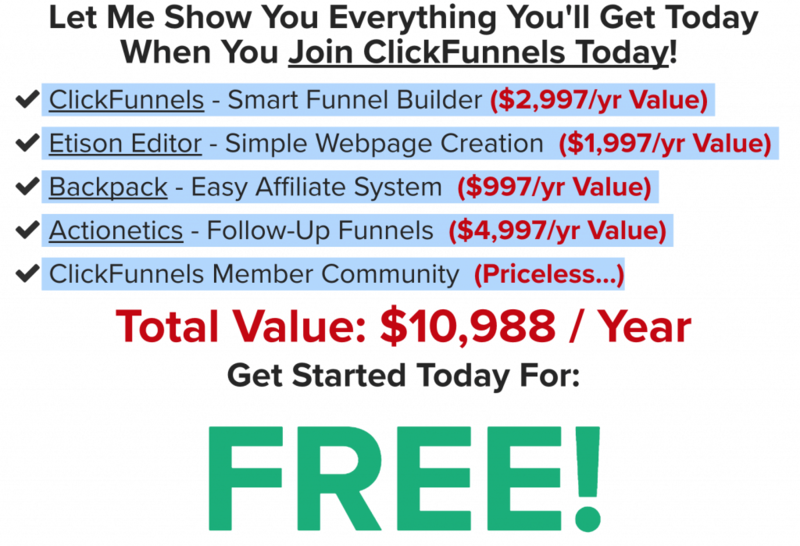 So what do you think about Clickfunnels? Do you think it’s a worthy investment? 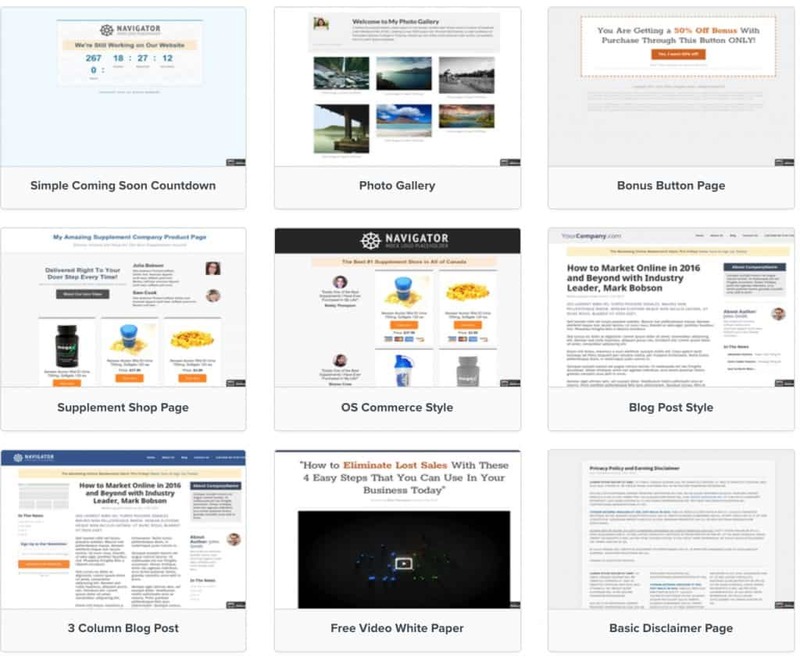 How does ClickFunnel compares to free alternatives like Bitrix24? From what I can see Bitrix24 and Clickfunnels are two entirely different softwares. I don’t see Bitrix24 being able to do landing pages and funnels which is the main seller for Clickfunnels. Either way, Clickfunnels is one of the leading companies that does funnels online and probably the best out there among all other companies that I have seen.